Preheat oven to 180°C. Line thirty-six 30ml (1 1/2-tbs) capacity mini muffin pans with paper cases. Spread the cupcakes evenly with frosting. Place the coconut in a plastic bag. Add the food colouring to the coconut and shake until well coloured. 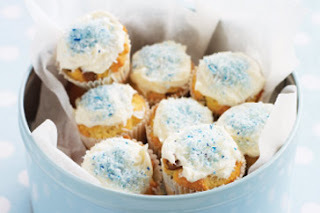 Sprinkle the cupcakes with coconut to serve. Vanilla frosting is available from the baking aisle of Woolworths supermarkets.